Colour: A luminous straw yellow with a numerous creamy effervescence. Nose: Yellow persimmon and walnut apple complex, the oxidation in the glass liberates perfumes of sambuco flower, basil, light fragrant and biscuity nuances. 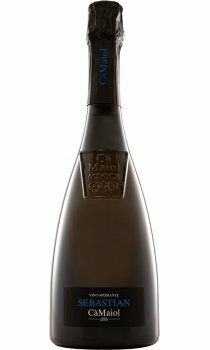 Mouth: On the palate the effervescence expresses all its creaminess. Soft with a balance between the acidic components an almondy finish. The white Charmat Sebastian wine takes its name from the founder of the Maiolo Farmhouse, the Notary Sebastian Maiolo, commemorated on the keystone of the door of the manor house. The early harvesting of the grapes, ideal for forming the base of a sparkling wine with more acidity, allows them to obtain the structure of a wine suitable for a second fermentation in its own autoclaves for 6 months.